iSpring has been a reliable development tool for us. We have found it to be almost 100% compatible with ALL of PowerPoint's features. It works very quickly in terms of development and generation of courses. When we've had a question or issue, the Support Team at iSpring is extremely helpful and always gets us a response within a day usually. It is feature rich, has good sound encoding, great video playback and excellent support for LMS tracking. Disclaimer: I have worked with iSpring in their show booth as an unpaid volunteer. I enjoy the product and have established friendships with people at iSpring. I would not be in their booth if I did not believe in their product. I don't care too much for their interaction builder, but I suspect new features are being built into it. For me, that's a minor dislike as I can inset other objects that do the same thing. WE have helped many people convert existing PowerPoint content, made it interactive and dpployed it for them. Quick turnaround time, solid source and happy customers make is very happy! "iSpting ieasy to learn, easy to use, many output options for all needs, LMS, youtube, website, HTML5"
Customizationis easy to deploy, using graphics and narration, to match each learning experience. Many interactivity tools make branching learning experiences much easier than other authoring tools. I have not discovered dislikes, as soon as I start thinking, wouldn't it be great if....and a new update is available accomplishing that a couple of additional features. The software is very intuitive, the support area of the website is almost unnecessary for most users, some of the support videos are really basic, and at the same time, very useful and will empower greater efficiency. Versatile product makes micro and macro learning effective and engaging, iSpring saves time in the authoring and reusing interactive learning assets. Thank you very much for sharing your kind feedback about our tool. Our workforce includes many frontline training staff who wear multiple hats: many are classroom trainers as well as part-time designers of face-to-face as well as online learning experiences. While we use a variety of tools, iSpring is easy and affordable for them and helps them do more than just shovel bullet points onto slides and upload them as "eLearning". The interactions, quiz types, and new characters offer easy opportunities for building in interest and some interactivity. I would like to see a drag-and-drop interaction option. As there is an existing quiz question type that allows for dragging puzzle-piece-shaped boxes I am assuming the basic programming for this already exists somewhere in the product and would not be too hard to repurpose. Take advantage of trial periods and really push the product to see if it will meet your needs. See above. For many of our users we especially need a tool that is easy to learn and relatively inexpensive. "iSpring is Elegant, Easy and Excellent"
I'm an independent eLearning professional and believe in using the right tool for each project I'm given by my customers. I use PowerPoint add-in tools, tools that run outside of PowerPoint and cloud-based tools as well. iSpring Suite is an essential tool in my quiver of arrows, especially when I need a tool that lets me develop eLearning quickly to meet a tight deadline while still ensuring that the eLearning is well-received and engaging. iSpring works very well for me in these situations and at times when I have more time too. Like all PowerPoint add-in tools, it doesn't have some of the more powerful features of non-PowerPoint tools, but not every eLearning project needs that power, so it makes eminent sense to use a tool that's easier and faster to use. iSpring's Suite of tools simply works and works very well. It is a real pleasure to use iSpring Suite. I don't and won't expect that iSpring will ever have the power that is usually found in tools that are not installed in PowerPoint and in fact, adding that level of power would cause iSpring to not be as easy to use. While staying in its class of easier and faster tools to use, I would like to see more interactions built into the iSpring Visuals because currently there are very few. It would be nice also to have some more drag-and-drop options outside the ones that are currently included in the quiz, though they should be also easy and not too cumbersome to use. When you need an eLearning development tool that is easy and elegant and does not have to include a lot of more powerful features, check out iSpring Suite. It's a sweet Suite! As I mentioned above, I work on a lot of eLearning projects for my clients and I do believe in using the right tool for the job. When a job has to be turned around quickly but nonetheless exceed client expectations, iSpring Suite is a great fit. Professional software environment, fully integrated into our daily Powerpoint routine. Quiz making with many students at the same time. Automatic results tracking, detailed reports exportable in pdf format. "iSpring Suite: Highly robust and reliable"
iSpring is the best engineered, most reliable eLearning development tool that I use. As a Training Consultant, I use many different eLearning tools, depending on the project and my client's wishes. With some tools that I use, I worry about the published lesson because the things that I build do not always work in the finished product. But iSpring REALLY WORKS. I've thrown many challenges to iSpring over the years (Windows 8, Office 13, various devices, etc) but the always seem to be the same: it works. On the desktop. On my iPad. On a Samsung Galaxy or iPhone. It WORKS. Because I do a significant amount of eLearning for software tools, it would be a big plus to have an integrated software simulation tool in the iSpring Suite. It would also be nice to have additional audio editing capabilities that allowed developers to at least select and delete clips of audio. It's not critical for me personally because I prefer to use a more robust audio tool (Audacity or Sony Sound Forge, for example), but there are some who like to have all tools in the same package. Test it on every device and in every environment you can dream of. The more you challenge it, the more you'll love it. * Rapid development. When I talk to people who don't know the world of eLearning very well, I tell them to open a PowerPoint file and click iSpring's Publish button. That's it. Congratulations, you're now an eLearning developer. Well, of course, there is much more to it than that - but if you are starting with a slide deck, it's definitely true that you can get an eLearning lesson with a click of a button. * Short Learning Curve: If you know PowerPoint (and most training people do), you are 75% of the way there to learning iSpring. * Enhanced Collaborative Development: You are using a PPT file as a base for your lesson - not a proprietary format. That means that you can hand your file over to an SME, a Graphic Designer, or others on your team to share development duties. That can be extremely helpful in many environments. "Best by far when it comes to extract most out of PowerPoint." All in one presentation explorer. Maximum support for PowerPoint features. Customizing options for publishing content. We are using iSpring Suite for various projects specially E-Learning for K-12 segment with the content that was ready in PowerPoint. We got exactly what we wanted and talking about the quality of conversion it is really satisfactory and students using it have also given positive feedback about it. "iSpring is a CAT - Complete Authoring Tool"
We enjoy the simplicity of the product Usability and User Experience of the product and its ability to produce e-Learning contents supporting current trends like HTML5, TinCan API and other latest standards made this product stand out from the crowd. Also this is one of the cost effective production tools I have used in similar lines so far. Limitations with the predefined templates and navigation styles. Could have been more with creative options in the template/designs. During the evaluation process we have short-listed close to 10 products and found iSpring passed on our project requirement check-list and I strongly recommend iSpring to others. We are addressing the scalability issues of our training program which is limited currently, Now, we are creating a blended learning program using this software which address more users with consistent delivery. "a practical and powerful solution"
10. reports to a server mail or forward progress. We recommend iSpring to many of our SmarterU clients that are looking for an easy way to convert and augment Powerpoint presentations. Their software is well engineered, and performs more reliably than a competing product from a larger company. We'd love to see some additional quiz question templates, and an offline player than transfer scorm results back to our LMS. "Easy program to use in developing e-learning material"
Over the years I have used various authoring software to create topic overviews, supplemental material and tutorials for my students. Although some of the programs were very robust, they required learning how to write script to get the project completed. The iSpring Suite now allows me to quickly and easily create similar material without the need to write script. The software allows developers to take existing PowerPoint presentations and transform them into material that can be uploaded to our LMS. The ease of use will allow those that want to create e-learning material without the hassle of learning to write script or code. iSpring allows you to take existing or new PowerPoint presentations and create media rich material. Created projects are easily uploaded to educational LMS systems. Being able to add quizzes within the material as a way to assess user understanding. One of the main problem that I am able to solve with iSpring is being able to easily create e-learning material that can be uploaded to our LMS (Moodle). Very fast support for some induviduel problems we had. Typografie is to static and limited in styling. 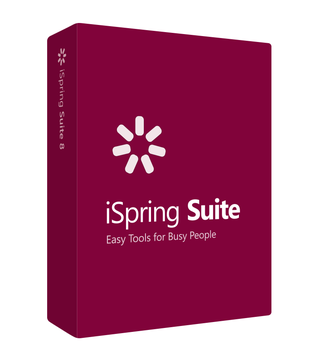 "Review of ISpring Suite 8.1"
I was most impressed with the ease of use. ISpring Suite 8. 1. The software had almost no learning curve because it fully integrates with P owerpoint. I was able to get up and running almost immediately. I also think the feature set that is present in this version of I Spring Suite 8.1 is outstanding. The scenario builder is an amazing and powerful application which is easy to configure and implement. The final thing that is absoolutely amazing is that all of the interactions that were originally set up in my Powerpoint presentations are fully operational after they converted over into HTML5 The conversion also takes place very rapidly which is impressive when compared to other programs where conversion to HTML 5 can take a very long time and can be associated with nonfunctional output. I do not have any strong convictions regarding any aspect of the software that I do not like. I have used many other platforms found a splint Suite 8.1 to be one of the most helpful applications have tested today. It does provide tremendous simplicity and that it fully integrated into PowerPoint. By utilizing I Spring suite I have been able to greatly expand the content as well as the capabilities of my presentations. I also feel that the integrated quiz features and interactivity provide an exceptional means by which I can engage the audience during presentations. I would strongly recommend purchasing this product. The the price of this product, the ease of use and it seamless integration with PowerPoint make an excellent choice. I Spring Suite has enabled me to rapidly produce exceptional presentations which have been using to educate high school and college students. It provides very powerful yet simple to use tools that have enabled me to focus on development of the presentations and not worry so much about a huge learning curve must be overcome in order to produce content. I think when you combine ease of use and powerful features this is one of the best software products available for developing E learning content. I think when you then add the amazing low price for this software it clearly places I Spring Suite in the class all by itself. I would strongly recommend this product to anyone considering a purchase. "I have been developing Accounting content for schools with this product since 2012." The limitations with flash conversion, I would like to see the limitations lifted to more than 200 slides. Fantastic product. The iSpring team have always taken my needs into consideration and assisted where ever they could. They are like my "family" in New York! With one single program you can publish across all the platforms. "Great e- learning designer tool"
I met with seven different vendors prior to go with Ispring Suite. Very reliable software, easy to navigate and be creative. I like the fact that I can target different platforms (LMS, web, executable, save test in words, etc.). I also like the ability to customize the player, is a pretty extensive product in terms of features and capabilities to fit my specific needs. ISpring is a great deal of interactivity and is included in the basic package. But, what is behind the product is the most important for me as a Director of Training. I spring has a such support team that I have not seen any support team that works together and respond in short period of time. Outstanding Team! !- " High ten". Very quick to respond and they have been very patient in helping me to learn more about the LMS and the software. The only minor dislike I have at this point is with the Quiz maker, I would like to see more capabilities to edit pictures and be able to move them around the slide. Like a picture tool. If you are looking for a full package without spending crazy amount of money and extra charges. Give a try to the iSpring team and you won't regret. Our company has noticed a need in our Above Restaurant Leaders and Regional Manager to reinforce their development as leaders. They opened a position and a department to support the field personnel. I am that person in charge to develop and provide the support in the field. Therefore, I had to develop a system that will provide them with the support in an effective way, simpler and with mobile capabilities. ISpring Suite allowed me to do that, save me lots of time, effort and in a very cost efficient. Kudos!! Just wanted to quickly add that in the most fresh version of iSpring QuizMaker it is possible to crop an image and move it around the slide using the slide view. Keep up the great work and let us know if you have any questions! "The Book Feature attracted me to upgrade to iSpring Suite"
I would add a hyperlink feature withing the book interaction so that the concept of interactivity between the student and the content will be taken to a higher level. This product has been designed with Instructional Designers in mind. It is great for online education. The learning curve is extremely low and it will make you look good even if you are not a graphic designer. Chunking information and presenting it in a digestible and elegant manner utilizing the book interaction feature. Thanks a lot for sharing your positive feedback on iSpring. We are happy to hear that you were able to discover all the powerful capabilities of the tool and use it to its fullest potential. As per your feature request, our developers are planning to implement such a capability sometime in the future. If you have any questions, just let us know. We'll be happy to help! ISpring has so many essential features and is so reliable and easy to use and totally integrates any media you throw at him. The program is very efficient and reliable. It is intuitive and there is practically no learning curve. It will do what we want him and beyond and it is only limited by our imagination when creating presentation, all interactive and running smoothly. Publishing is awesome with many possible output than one can also fine tune. All is very clear , simple, efficient effective and functional, and so easy. Did I mention it never crashes. I do not dislike anything but perhaps it is not a stand alone program. Add on to power point but really not so much a problem as I can also benefit form this awesome combination. So, no real issue here. For Power Point conversion, I have tried several products' free trials with regards to features and price, both. I was looking for a product that should covert my Microsoft power point presentation to exactly the same as it appears in my presentation show and make sure that no slide is able to be copied. And iSprint Converter Pro 8 is the best product amongst all I tried. I am extremely happy with the product features, professional technical support, and price. I am using it for personal use, I want my professional work to be protected even the business environment I worked. Therefore, I bought iSpring 8 Converter Pro personally. "An innovative way to produce innovative e-learning material"
I'm always looking for new ways to produce e-learning material for my many students and subscribers around the world. I teach English online, through eBooks, interactive material, and videos on my YouTube channels. I also teach one-to-one classes using Skype. With the continuing decline of advertising revenue from my YouTube channels and websites, in great part due to the increasing use of ad blocking software by visitors, I'm always looking for new ways to develop new material that can help me to support my business financially. I've been looking at iSpring software for some time now, the latest introductions to the iSpring Suite 8.1 software means that it now contains all the features that I need. As the software is obviously continuously under development, it is likely that the entire package will evolve to bring even greater innovative possibilities to my work. Indeed, I made a suggestion for including audio files in part of the software capabilities and was told that this was already under development and would shortly be released. Until now I've been using other software packages such as the Adobe Creative Cloud and animation software, which I will continue to use, but now I must master PowerPoint. The possibilities inherent in the software are obvious, but I guess they'll be another month spent at Lynda.com mastering it. iSpring Suite 8.1 is allowing me to move away from more traditional PDF-based English learning material, which has problems when being used on mobile devices, to being able to produce material which works on all devices and is much more engaging for the student. Thank you very much for sharing your case of using iSpring. We hope, you keep enjoying working with it! Just let us know if you have any questions, we'll be happy to help! "Easy to work with + excellent service"
It's easy to use for everyone that has Powerpoint experience. There is (virtually) no additional training required. Alsso: whenever we have questions or encounter issues, the iSpring support desk is always very helpful and responsive. As it is a standard application sometimes it takes quite some effort to change certain setting (e.g. changing the font of questions in a quiz). We deliver e-learning courses to our customers. iSpring has enebled us to be much more flexble and up to date (compared to the previous situation where all changes and requests took 'ages' at our custom software provider). Hi and thank you for sharing your experience with using iSpring Suite. "A solid product with a gentle learning curve"
The user interface is comfortably easy to use, and the ease of setting preferences made this product really stand out. I have used many similar programs when designing course materials, and am completely sold on iSpring Presenter. A stubborn difficulty in having the presentations autolink back to the main site upon completion. This will, though, be figured out in time. Preview it, play with it, have fun with it and then purchase it. You will find a way to constantly surprise yourself with it. Educational outreach to 400 + staff in remote locations, along with a dynamic presentation package for clients. Thank you very much for sharing your wonderful feedback on iSpring! As per the difficulty with linking back to the site, could you please send your question to support@ispringsolutions.com. Nothing at this moment, after final evaluation we will be more comfartable for recommendations, if any. We are a four (4) hospitals and multiple medical offices healthcate system with 3,300 employees. Is a big problem keep an updated educational requirements manually. "I’m happy iSpring Learn has exactly what I need." As a Microsoft Certified Trainer, I’ve taught Excel to more than 2,500 employees from various companies. Starting from 2015, I’ve been developing Excel courses in SCORM format. I currently practice blended education, which means that some of my courses are face-to-face, while others are available online through iSpring Learn. I’ve been using this LMS for nearly a year now, and I’m very happy with the capabilities it gives me. I really enjoy easy publishing that takes no time, as well as the wide range of available reports. I also like that I can set time restrictions for published content so that it can only be viewed before a certain date. Since I sell my courses online, simple e-commerce settings are really important for me. I’m happy iSpring Learn has exactly what I need. I consider it a perfect toolbox for e-Learning authoring that saves me both time and money. It’s extremely easy to use, the interface is intuitive and crystal clear, and the navigation is very simple. With iSpring Suite, the learning curve is kept to a minimum. What I especially appreciate about iSpring Suite is its ability to publish courses right into iSpring Learn LMS, which I started using for training my employees about a year ago. Many thanks to iSpring engineers and support experts for the truly awesome products and service! Thank you very much for sharing your positive feedback on using iSpring! We are happy to hear that you chose iSpring Suite and iSpring Learn as your integrated solution for e-Learning! What I like best about iSpring is the ease of use. It is an add-in for a product that most elearning developers are already familiar with, PowerPoint. I like the flexibility that it gives me from creating quizzes to interactions. It seems like every month they have a new feature and/or they have improved on an existing one. The support is also amazing, they constantly reach out to see if I am happy with the product. In my current position, I need to create eLearning modules quickly but professionally. iSpring allows me to do that. It also allows me to add it to an LMS for xApi functionality. I recommend this product to anyone who does not want to tackle the complexity of an Articulate Storyline or Adobe Captivate, but still needs to produce a professional looking product with all the ells and whistles of the big boys on the block. Use the trial period and/or the free products to see if it fits your needs. Thank you so much for sharing your feedback on iSpring. As per your feature requests, we will definitely forward them to our Product Development team. And as per the webinar topics, I would love to hear what you'd like us to cover during them. Thank you in advance and keep up the great work! "I have been using iSpring for 2 years." Ease of use and the ability to import questions to a quiz. There are no items that I would report as a dislike about the product. We have transitioned our training system to a competency based training due to the ease and flexibility of iSpring. Thank you very much for sharing your nice feedback about iSpring! Simple doesn't mean featureless. This is a robust platform. We needed something that our team could use but also something we could get our customers to use as well. Robust enough for our needs and simple and cost effective for our customers to use! Also, great customer service. Haven't encountered any dislikes yet and have been using for 3 months and ave created over 20 training programs. I like teh output a sit works in every environment I have tested and really eager good customer support. Articulate also has excellent customer support so it came down to features and price as we are specing software into client installations of our LMS. We are subject matter experts and deal with a lot of other SME's. We have our own LMS but building out content with SME's is difficult process. We like integration with Ispring Cloud. Thanks a lot for sharing! It is so great to hear that you found iSpring feature set distinguishing among others! Keep up the awesome work and let us know if you have any questions, we'll be happy to help! My software stopped working, I did have suite 6 and I updated to 8.1. It still didn't work, so I contacted the support team for help. They were able to schedule a session to look at my computer the same day and had their specialists on the issue right away. I was frustrating because I was mislead to think that buying a new version would solve my problems. When I bought it and it still didn't work I was a little frustrated. My issue wasn't a business problem, it was a software problem. Every time I tried to open a quiz in PPT it would close PPT and show my program down. I am still not sure what the issue was but they were able to fix it and I am not able to access the quiz function through PPT without issues. In case of any questions you are always welcome to contact support@ispringsolutions.com, we'll be happy to help! Very easy to create basic evaluations for learners. QuizMaker helps to keep track of learner progress, pinpoint areas of need, and provide learning opportunities. Thank you very much for sharing your kind words about iSpring, Duane! The ISpring Suite is an easy to use and high quality course authoring tool that leverages your skill sets as an addin to PowerPoint. The suite allows adding interactive activities, quizzes of many types and a glossary to a PowerPoint presentation. The resulting presentation can be produced in SCORM 1.2 or 2004 for seamless integration into most LMS. The best feature is the automagic presentation on computers, tablets and cellphones. This is a powerful feature and is well done! To date, i have not found anything that i dislike. I would like to see additional interactive activities that will help make presentations more interesting. Also, adding words to the glossary is a bit tedious at this point. While I am not sure how to improve it, it is slow. This was our choice after evaluating several other authoring tools. We strongly encourage authors to look into this product. We are produce high quality online courses for security education, training and awareness. We have benefited from the ISpring Suite by leveraging our existing PowerPoint content and easily porting this content into SCORM modules. We have realized a huge time saving with this capability. It is so great to hear that you chose iSpring as your authoring solution. "The best e-learning tool for PowerPoint users"
It's really easy to use and if you master PowerPoint you will be able to create interesting, interactive and meaningful e-Learning courses in no time. I've worked with several LMS (Moodle, Sum total, Saba, Chamilo, etc) and iSpring integrates seamlessly with them. This is something I really appreciate, since I also work with other e-Learning authoring tools and you need to know some tricks to make them work in the LMS. That's no need with iSpring Suite. Some interactions, like the flipbook, are not fully customizable, you can not use your own fonts or backgrounds. Would be great, for future releases, to have some visual effects in the video editing tool. The only recommendation I'd give people who are considering iSpring Suite is that you need to master PowerPoint, and I'm not talking about making any kind of bulletpoint presentation, I'm talking about creating visually strong, organized and coherent courses. iSpring is really easy to use and is a PowerPoint add-on, you'll be taking the most of it if you are able to create beautiful and powerful PowerPoint content. iSpring has helped us to give a fast delivery to our clients. It's also an affordable tool which is very important to medium size business. Thank you very much for sharing your honest opinion on iSpring. It's great to hear that iSpring Suite became a part of your toolbox. And thank you for your feature request, we'll definitely pass it over to our Product Development team. As the iSpring slogan written on the handbag I got in DevLearn 2015 - it’s an “Easy Tool for Busy People”, intended for Instructional Designers such as myself who want to develop creative learning experiences without having the technical skills. Thanks to iSpring’s amazingly quick and efficient technical support I was able to develop my iSpring skills and use its features to its fullest. It would have been nice if iSpring adds some visual interactions such as Drag & Drop, and make the interaction feature more sophisticated. I am now in the process of exploring the topic of mLearning, and started using iSpring for prototyping mobile learning apps that will later be developed into real Mobile Apps. For me this is a quick and easy use of an existing tool that I am already familiar with for a new development domain, in addition to using iSpring for the development of courses that can be viewed on all devices. Thank you very much for sharing your detailed feedback about iSpring. "Quickly developed an interactive presentation for a trade show." Using iSpring Suite I've very quickly created an interactive presentation for an upcoming trade show. We will be using the presentation on iPads and Surface Pros, engaging attendees directly. The presentation relies heavily on animation and triggers. Other than one small problem that the support team quickly alleviated (with a fix), the product has worked really well. I like the fact that I can target different platforms (web, executable, etc.). I've only been using the product about a week, so I am still learning its various capabilities - which are extensive. I also like the ability to customize the player to fit my specific needs. The support team has been awesome. Very quick to respond and I have yet to stump them with a problem. And they have been very patient in helping me learn different tricks and techniques. I haven't really used it as or with a LMS yet. My next project will be to create a series of video presentations showcasing the features of our products. Overall, very satisfied so far. The only minor dislike I have at this point is when you are recording video or voice overs, there is a distinct break between slides. The volume at the beginning of each slide is low and then slowly increases, introducing background noise. This may be something that I can remedy. I've only done very preliminary testing of this feature. iSpring Suite is a pretty extensive product in terms of features and capabilities, so allocate sufficient time to go through the trial. As I mentioned, the support staff is very helpful and gives great guidance. I would also suggest having a plan of attack based on a prioritized set of business problems/objectives you are working against. Otherwise you may wander around and not experience the full value of the product. We are a small startup and don't have a large marketing department or staff. So I basically do all collateral and customer facing content. Therefore, I need a tool that very quickly lets me repurpose existing assets such as presentation and videos into new, fresh content and formats. iSpring Suite allows me to do that, save me lots of time and effort. Thanks a lot for sharing your feedback and valuable recommendation on iSpring. We hope that the trade show went/will go very well. Keep up the great work and let us know if you have any questions, comments or suggestions! Ease of use is the top reason I like ISpring Suite. The products interact together nicely and seamlessly. I have used many other authoring software solutions but my go to solution is ISpring. "Ease of use, cross-platform functionality, and quality of training packages "
Ease of use and quality of training packages. End-user ease of use. Quality of final product. Quiz maker. All these features are nicely integrated for a powerful e-learning tool. Great product. Nothing at this time. Additions were mentioned in the Features tab. Not as robust as many other authoring software programs. Provides an economical and simple method for deploying training assets throughout the company. "The user-friendly solution to mobile SCORM devleopment"
I've been very impressed with iSpring's customer support system. When I've placed a support request using the simple form on their website, I consistently receive a response the same day. I've also used the support phone number and the person who answers the phone (no wait times) is the person actually helps you troubleshoot. They are all extremely pleasant and professional! I also really enjoy the speed of the interface. Importing audio and video takes very little wait time and synchronizing audio and narration is a very streamlined process. The only thing I dislike about the program is that there is no way to convert the interactions and quizzes I've developed into iSpring's version. They do similar things, but the formats are very different so it's quite a time consuming task. If you are currently using Articulate, take the time to export all the audio, image and video files from quizmaker and engage and copy/paste the text in another file before recreating them in iSpring's version. I made the mistake of not doing this and when I removed the Articulate quizzes and interactions, it also deleted (permanently) the ones I recreated in iSpring. Also, at first site and from reading all the tutorials, you would think there isn't a way to import MP4 videos because it's all about Flash. There's an 'import video' option within the narration manager, but it's only for the presenter video and will only play in the presenter video box. So, in order to add an MP4 instead of a Flash, you have to embed the video into PowerPoint (using PP toolbar - insert - video - choose play automatically). For the past 9 years,I have used Articulate and have always liked the easy user-interface. What I didn't like were all the bugs associated with it. Up until this past year, SCORM packages could only be published as Flash, but with mobile compatibility being a must, they offered an HTML5 publishing option. However, Safari (browser for all Apple products) does not read the output created by Articulate. They recommend using their mobile app, however unless you have an LMS with TinCanApi (which only a very few do) the package will not even play in App. I was becoming more and more frustrated with this issue and then someone recommended iSpring. "iSpring is the fastet authoring tool to develop high quality courses"
It is very easy to use and you can work with PowerPoint, and export to html5 or web or flash, and I like the fact that they have a free license, so some faculty members can work on their materials and we help them to finish their projects. They fixed the issue with section 508 and added the feature to record your screen. Right now I like everything about iSpring. I am a big fan of iSpring! Since you work with PowerPoint, it is very easy to use, you can integrate a lot of resources like videos, weblinks, quizzes, they have a lot of options to create quizzes and surveys. I like it a lot. Integrate instructional materials in one single file. Instead of having thousands of instructional materials on Blackboard, we could integrate quizzes, content, videos, Weblinks within iSpring module, easy to use and edit. "PPT to HTML5: Impeccable Conversion"
interactive PPT-based courses and presentations that can be created very fast and can be accessed through different devices. The support from iSpring is phenomenal. Everyone I've dealt with, from pre-sale to technical support has been extremely knowledgeable, responsive, and helpful. Every one of them acts like a concierge at a high-end hotel. The audio editing capabilities are very limited. This is by the far th best overall solution for authoring training for delivery online. As an online training provider for public works professionals we work with experts in various topic areas to convert live training for delivery online. We needed an affordable tool that we could easily train people to use. iSpring Pro was just what we needed: relatively inexpensive, feature-rich with a gentle learning curve. iSpring Suite has become my tool of choice for creating online courses. While I'm not a corporate training designer (I create online learning for Catholic spiritual development). I love how easy it is to synch my video narration with my slides, and I love the look of the final output. iSpring makes course production fast and easy. The only thing I dislike so far is that the interactions are fairly limited. For now I'm bringing a lot of external interactions to my courses and using Adobe Captivate to create many of them. It would be nice if iSpring Suite would have more useful and flexible interactions. iSpring seems to be constantly improving. You have to pay for upgrades, but the upgrades are usually worth the cost. I wish the upgrades were less expensive, though. I can't always afford them. My main challenges were to create a personal learning experience with both face-to-camera video and my slides. Before iSpring, I was using greenscreen / chromakey. This was very time intensive and the quality was inconsistent. iSpring gives me the same effect with much less work and more consistent quality. "Fantastic product that fit my exact needs"
Ease of use. I can quickly turn a project around on a tight timeline that looks amazing and is simple for the learner. Making edits and design changes is a breeze and the integration with multiple LMS is what I like the most. The Quizmaker is simple to use and gives my clients lots of interesting choices. There isn't anything that I would say I dislike. I would say it would be nice to add better audio and video editing features to the program to make it simpler to change in a pinch. Perhaps in a later version. No brainier. Gets better every release. Simple to use and my clients love the final product. We have multiple LMS over different sites that we use Ispring to develop learning modules. We had also been using different products for the non LMS and LMS sites and wanted to have only one authoring tool to keep everything simple and Ispring has been the perfect choice for us. It offers plenty of features, and these continue to get better over time. The customer support is tremendous. I have no complaints. Anytime I've had an issue, the customer support helped me find a solution. I run an e-learning website. iSpring is instrumental in my ability to build our courses. This is a very easy product to use - no long learning curve. We produce successful programs for our graduate students in psychology and for the public. They always work well. I began with version 6, now have version 7, and eagerly await version 8, which I think will soon be out. It will be hard for iSpring to improve on something so good. Also, my questions have always been answered quickly and satisfactorily. I'd like to have the ability to insert videos directly from my webcam, from within the program. I think that will appear in version 8. and will save a small step during program development. It's better and cheaper than competitors! elearning is obviously part of the future of higher education. iSpring allowed my to quickly develop learning modules for my students. "Hany and excellent product for LMS"
"iSpring suite helps us reach more agents..."
The ease with which we can leverage the investment we make in the preparation of presentation materials so we can share effectively online. I also like the way iSpring tries to keep their product compliant with current distribution technology such as browsers and markup languages. Its an easy tool to use from with PowerPoint and is extremely sophisticated in the tools it offers for presentation creation. There's very little to criticize. Its not a tool one would probably use every day and so its unlikely that small user issues would become problematic. This tool is easy to use and offers a great solution for creating and sharing online training materials without the user needing to invest in additional software or install special viewers. It works well in the mobile environment too so students can review our presentation materials wherever they can access our website. The tool allows us to gain maximum return on investment in the presentations we prepare for our "real world" face-to-face training sessions and allows us to extend them to our online user community too. It also offers those who have been trained to review our presentations easily online and to use them themselves in their own training environments without the need to pass around heavy PowerPoint files or struggle with linked or embedded multimedia. Once the files are published and linked through our website, they can refer to them easily and they are high enough quality for professional presentations of their own. As they are published online, they are also "protected" from editing so we can be sure our messages will appear exactly as we wanted them. As the title says, "It JUST works". We started out using Articulate at the recommendation of our tech consulting company. At first it was good but as more and more users starting using iPads it became a problem since Articulate Scorms would not play on iPads. We also started having browser compatibility issues. Articulate released a new version which was supposed to be iPad compatible. We purchased it only to find (as a previous reviewer said) that it would only work with Tin Can and downloading Articulates app. This was not a solution for us because we needed reporting user completion to our LMS. We used the trial version and immediately became raving fans. Everything just works like it is supposed to. Plays beautifully on all devices and almost every browser. Also like their tech support. Very responsive and customer focused. They really work to resolve issues. As others have said, there are limited interactions. Perhaps there will be more in Siring 8? Use the trial version. Try the output on Apple products and other devices. You will be satisfied with how good it looks. Since we distribute e-learning all over the continent we had no control over what device users use, or what browsers and what settings they have on their computers and devices. iSpring has mostly solved that issue. We get very few tech support requests because of incompatibility. We also needed something that reports clearly back to LMS (Moodle). Does it perfectly. And software that was straightforward to use. We are course designers not software engineers. iSpring filled the bill there. We have found some very creative ways of using it that we could not have done with Articulate. Benefits - HAPPY CUSTOMERS, reasonably quick authoring (saves time). Good looking courses. "User Friendly, great features for a great price"
iSpring runs as an add-in for PowerPoint and offers a great set of features for professional quality eLearning modules at a reasonable price. Anyone who can make a PowerPoint presentation can produce eLearnjng packages with animations, branched navigation, characters, embedded video, and comprehensive quizzes. I've used other eLearning packages that cost far more than iSpring but they are harder to use, take longer to make similar presentations, and iSpring offers almost all of the same features. I recommend iSpring hands down. There are some products that cost quite a bit more that do offer more interactions than iSpring. Great package for easy authoring of professional quality eLearning modules. I produce eLearning modules for nursing education. The iSpring package allows me to produce high quality modules in no time at all and without having to learn a complicated program.